May 29, 2011 by Alphageek in "alphageek", "review", "urbanspoon"
We stopped by for a quick something to eat and were pleasantly surprised by our food at Burrito Bistro. Also known as B2, this place serves up a large number of burritos that seems to be gaining popularity these days. We stopped by and took a quick look at the menu. Mrs. Alphageek quickly decided on the Thai burrito and I settled on the Buffalo burrito. They offer two sizes, and we each selected the smaller of the two sizes. We sat down and took a look around. B2 offers a salsa bar that includes some chopped jalapenos. We sampled a little of the salsa, and found it good, but somewhat middle of the road. Mrs. Alphageek's Thai burrito is pictured above. She likes how she staged the picture of her burrito better than I staged my picture, so we will start off with hers first. The bite she gave me was very tasty with ingredients that tasted freshly prepared. 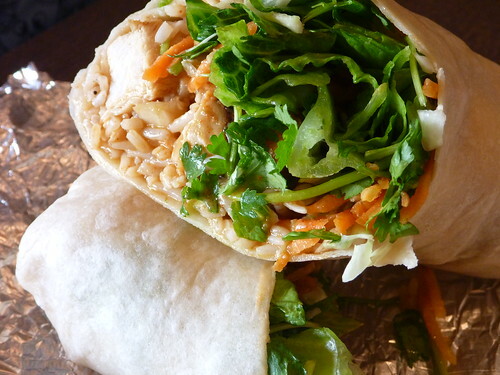 The burrito had a very Thai inspired taste, and even included a touch of cilantro. The only way to improve this excellent burrito would be if the sauce were made fresh, like the rest of the ingredients. 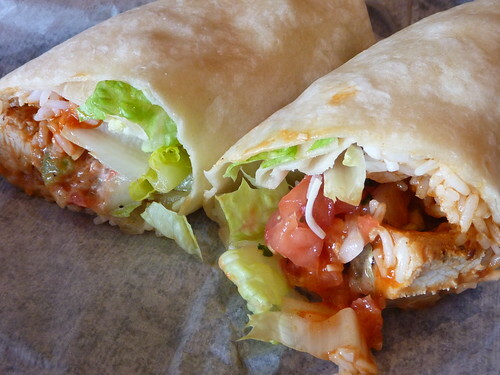 Pictured above is my Buffalo burrito. I think the picture is good, but Mrs. Alphageek says hers is better. I found this burrito to be a great break from the usual fare that we get when we order a burrtio somewhere. The simple combination of ingredients with a great middle of the road buffalo sauce made for a great meal. It gave a reminder of great buffalo wings that have just the right amount of heat. I did not even need to add hot sauce, so don't order this if you are sensitive to spicy food. This is a short review, but that is a good thing. Stop by if you want a simple, quick meal that is well prepared.